For the last several weeks, I’ve had this terrible feeling that I would have to flounce from the internet altogether to retain my mental health. It’s not that I don’t love this blog, or that I don’t adore having a real audience for my writing,* or that I don’t have anything to say about what we talk about here. It’s just that I’ve been writing and moderating here for almost three years,** and I am tired. I’m tired of high-speed, high-quality interactivity. I’m tired of multitasking. 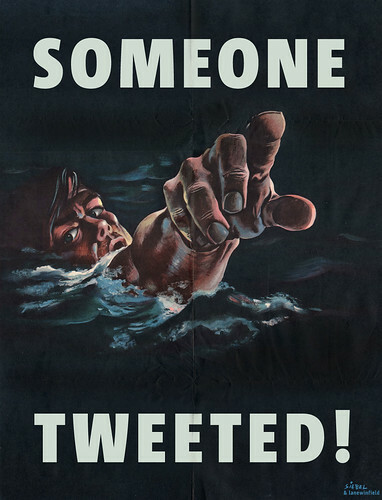 I’m tired of keeping track of commenters; much as I love you all, there are just so damn many of you these days. I’m tired of reading drive-by trolls whose sole purpose in life is to hurt me and anyone else who happens to be reading. What I’m not tired of, thank god, is reading and writing; I’m tired of talking. Bone tired. Kate’s post hit me between the eyes: I need to make more room in my life for being absorbed, for letting my mind stay with one thing for a while without wandering. If I don’t do something differently, disaster is imminent. So here’s what I’ve decided: I’m not gonna flounce off the internet. I’m not going to leave the blog and scorch the earth behind me. I’m just going to take a Shapely Sabbatical. You won’t see me around here for a while (except possibly with an occasional comment, link, or especially clever lemur). I have complete faith that my co-bloggers will soldier on just fine without me, and that you all will play nice and follow the ever-more-draconian comments policy we all know and love. And I trust that I can go on sabbatical, work on my dissertation and my poetry and my sanity, and come back to blogging when I’ve got the passion for it again. *It still floors me, in fact — I can write something, and then thousands of people will read it and pass it on! I have dreamed of having that kind of audience all my life, and it’s no less delightful even with my author photo as a cartoon and my nom de plume stolen from a Doty poem. **I believe that’s thirty in Internet Years. If you haven’t been over to the SP Ning community in a while, you might be interested in the clothing swap thread Angie G just started. She noted the number of people who commented on Snarky’s recent post on wanting to get rid of clothes that don’t fit and thought that a swap might be the perfect solution. If you’re interested, pop on over to that thread (and please, everyone, abide by the honor system!). And if you are new to the Ning community, click here to register (you might have to wait a few hours for one of us to approve your membership, so please be patient). Apparently, Randy Michaels, the CEO of Tribune Co. here in Chicago, has issued a list to the reporters on WGN, our local public radio station, containing words and phrases they must no longer speak on air. These are not dirty words, a la George Carlin, but words that sound like “newsspeak” (according to WGN news director Charlie Meyerson, who passed along the list to the article’s author). Presumably, this means sounding too much like a cliched newscaster and is not to be confused with cracking down on thoughtcrime. Some of the phrases listed probably do deserve to be retired as outworn cliches: giving 110%; mother of all (anything); senseless murder. Some of them, though, seem designed to make a reporter’s life a lot more difficult: how are you supposed to report one of those senseless murders without using the word “alleged”? 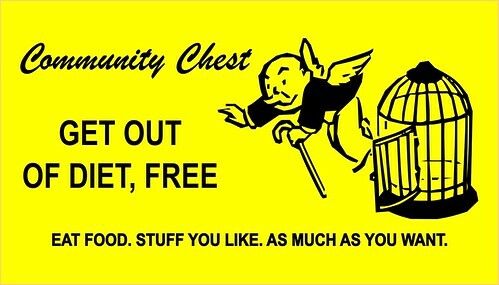 What other Monopoly cards could you use right now? The medical procedure involves stitching a small piece of polyethylene mesh onto a patient’s tongue, making it painful to ingest solid foods and forcing a low-calorie, liquid diet. You pay a nice man named Dr Nikolas Chugay to spend 10 minutes to stitch a torture device into your mouth, and you pay him $3,000 for the privilege, and then you eat 750 calories a day for a month. And you lose weight! And also you forgo all pleasure in life because you are combining constant pain with a sub-torture level of sustenance! According to the article, “Since last September, Chugay says 35 people have opted for the surgery.” That’s 35 people who hate themselves so profoundly that they paid a doctor $3,000 to sew a pain patch into their mouths. Can someone please wake me when we’re in that post-feminist world full of jolly fat people that I keep hearing so much about? I’m going to go huddle in a closet with T-Rex till then. Have you seen Hipster Puppies yet? I am pretty sure it is why the gods invented Tumblr. I can’t decide which is my favorite, this one or this one but I am pretty damn happy about them both. Feel free to share puppies, lemurs, new blogs, weekend plans, what have you.